SARASOTA, FL (WWSB) - Sarasota County Sheriff's office says they have arrested an illegal immigrant, Magdiel Medrano-Bonilla, after he struck a motorcyclist during a road rage incident on Sunday, April 8. During the investigation, detectives say they found Medrano-Bodilla's car stripped of its tag, doors and windows. Detectives say they found messages on Medrano-Bodilla's phone that he was planning to destroy the vehicle to avoid criminal charges. According to the Sarasota County Sheriff's office, Medrano-Bonilla was born in El Salvador and entered the United States through Texas. The Sheriff's office will communicate with Immigration and Customs Enforcement to determine the next steps. According to deputies, the incident happened at the intersection of Beneva Road and Rivera Drive around 5:00 p.m.
A witness recorded the hit and run incident on his cell phone. The video was released on social media by a witness Sunday evening and is now being shared by detectives in hopes that someone can identify the suspect’s vehicle. 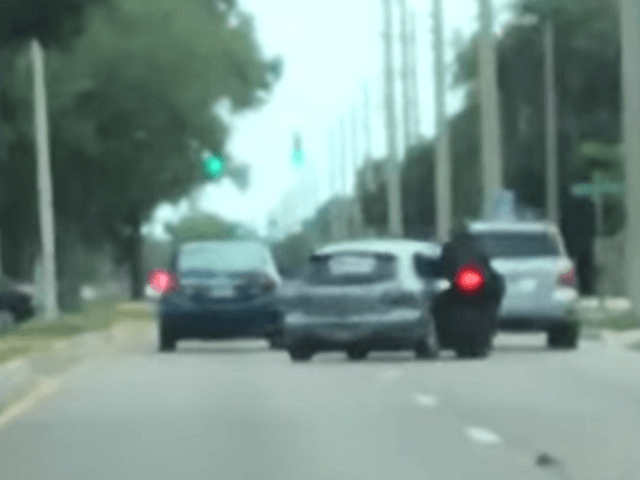 Sarasota County Sheriff Tom Knight reported that his deputies arrested 30-year-old Magdiel Medrano-Bonilla after a video showed him crashing into a motorcycle rider, The sheriff said the crash appeared to be a road rage incident. Following the release of the video, deputies found the vehicle that Medrano-Bonilla attempted to destroy in an attempt to avoid prosecution, the sheriff stated. The suspect allegedly stripped the vehicle id tags, all four doors, and the windows he explained. Immigration officials detained Medrano-Bonilla after he illegally crossed the U.S. border into Texas in March 2014, the sheriff said. Immigration officers released the Salvadoran illegal immigrant under President Barack Obama’s catch and release policies. A notice to appear set a December 2019 court date for a deportation.hearing. The video showed that a Mazda 3 hatchback intentionally swerved into a motorcyclist causing the motorcycle driver to crash, sheriff’s office officials said in a written statement. The victim sustained several injuries from the crash. Investigators found text messages on Medrano-Bonilla’s phone indicating he planned to destroy the vehicle to avoid criminal charges. Prosecutors charged Medrano-Bonilla with Aggravated Battery and Operating a Vehicle Without a License. He is being held in the Sarasota County jail without bond. The sheriff said he is coordinating with immigration officials to “determine the next steps. What a surprise. This was reported on our local news last week and it was never mentioned he was an illegal alien. artist, Judy and Beezer like this. Unreal - almost 6yrs he gets to roam @ the country, believe work permit after 150 days. That is catch & release for you and still going on. And how many hundreds of thousands of them are here? trumps been c&r since he took office over 13 mths ago. 30-40,000 a mth coming across and c&r. Are we really supposed to take them in and PAY for their livelihood, births, schooling, ESL teachers? All so more cheap labor can come in while we foot the bill for them & their kids and anchors? Exactly how many more do we have to take in before this expensive, dangerous nonsense stops? Sorry, but trump's DHS is doing the same thing obama's did, working for the invaders -except obama had his pen too, he bypassed congress and made decrees. And trump has been defending those decrees like daca and now continuing c&r. trump needs to get out his pen and decree due to national security and high numbers of people flowing into our nation, we cannot accept anymore asylums or continue catch & release procedures. Everyone will be turned around. Done. Then congress can fix the laws when they have time. NO more entries! Now they use their cars and DEADLY WEAPONS against us. Road rage, drink and drive...just mow us over. San Antonio has horrific car wrecks all the time...full of illegal aliens causing these wrecks! Get these illegal aliens off our soil. Stop them at the border and TURN THEM AROUND!!! Perhaps it's just the news reports I've read lately but it seems to me the worst of the worse is coming in from El Salvador. One man among the 169 who were crammed into three cells in the tiny police station had a tattoo on his forehead. It said, “El Diablo.” Another had a tattoo that read "Revolucionario" or “Revolutionary” in Spanish. “It’s a cause we’re starting ... to take care of each other,” the man said. 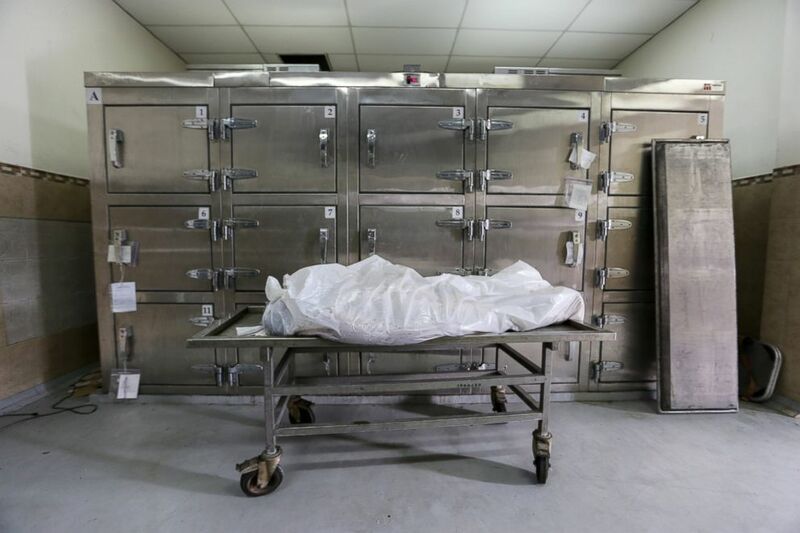 Every night, a forensic team from a local morgue heads out into the streets to collect dead bodies. When the bodies are brought back to the morgue, doctors take note of the person’s age and the trauma to the body. One was a 23-year-old man named Carlos, who was shot and killed inside his home after ordering a pizza. His mother insisted that her son wasn’t even in a gang. "He was everything for me. My only son," she said in Spanish. “They took him away from me. They left me alone." Later, in the middle of the wake service for Alexis, gunshots rang out. Eriselda’s only remaining son was thought to have been the target. Police said they believe since the service was held in 18th Street territory, the shooters were likely from MS-13, and the ordeal wasn’t over yet. 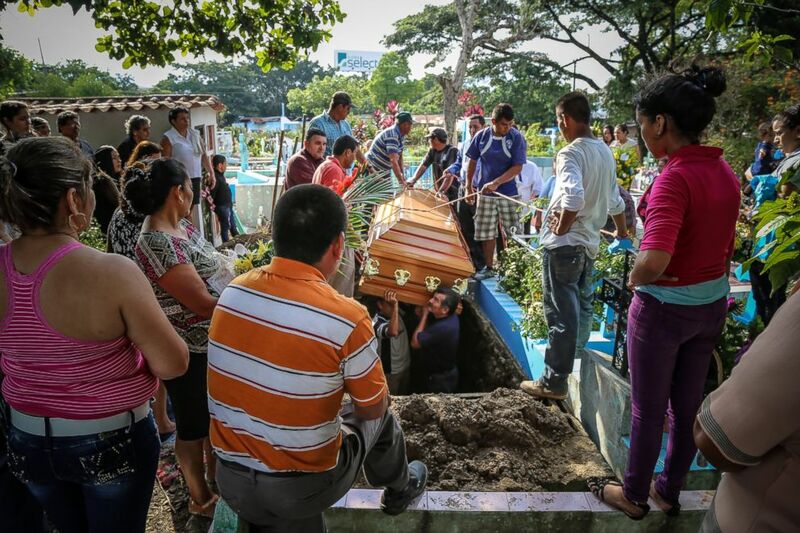 Eriselda still had the burial service the following day to worry about. “I’m nervous,” she said. “But I have to face this situation because it's my son I have to bury." The family said the best hope to have a funeral without violence was to ask for help from the local mayor, who is rumored to be tied to MS-13. The day of the funeral, the mayor got on the phone and seemed to call in a favor with one of the gang leaders, asking them to stand down. At the cemetery, Eriselda said, “I think they may come after me next. "They already took two sons from me, I don’t know what those murderers have in mind now,” she added. Clavo personifies the noxious symbiosis between the U.S. and El Salvador. As a boy, he moved to Virginia, where he joined a gang. Then he was deported back to El Salvador, where his gang career continued. 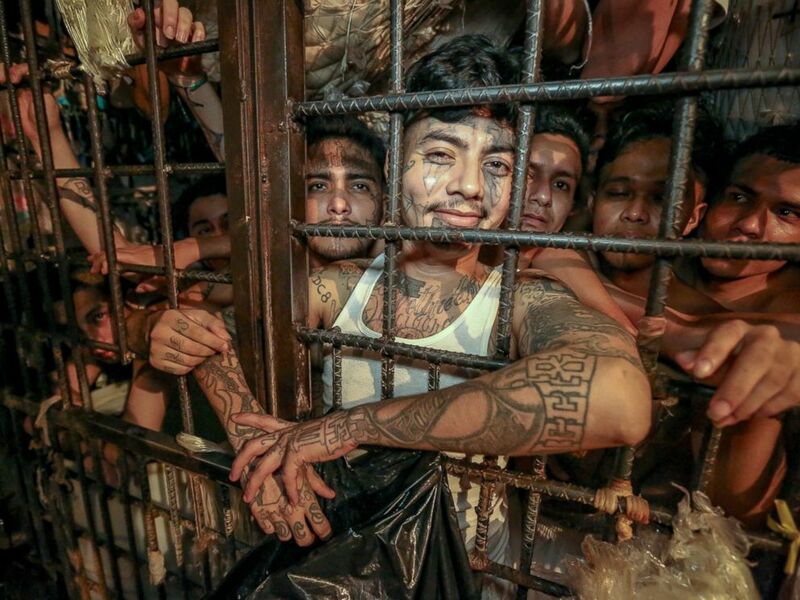 Now, he said he wants to sneak back into the States, in part to escape gang life, because he said he’s tired of taking orders from higher gang leaders, most of whom are in prison but can still make a phone call to have someone killed. Sometimes, Clavo said, he doesn’t even know why someone orders a hit on someone else. “They try to kill my family, my mother, my little brother, my sister,” he said. Francisco met with a lawyer because he believed if he went back he would be killed. Today, he learned he was granted asylum to stay in the U.S. In El Salvador, his mother lives on the run. She told “Nightline” gang members burst into their apartment one night and opened fire. Her children were hit, but she said they survived. "My daughter would have been killed if it weren’t because my son put his leg up [to block the bullet]," she said in Spanish. "I live in fear. I can’t go out to the corner because I feel like they’re going to kill us." He said the only route for peace is for the government to negotiate with the gangs. 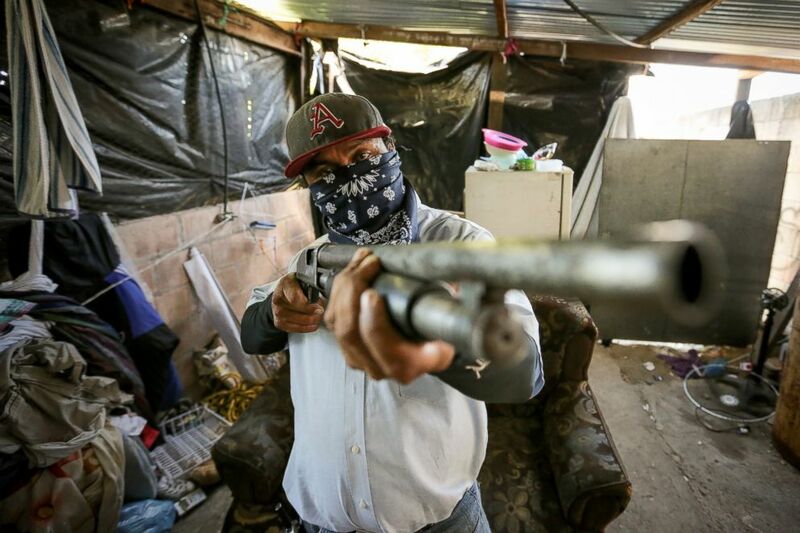 As a show of force, Santiago announced a cease-fire between MS-13 and Barrio 18 right then. The next night, the local morgue was quiet. There is just no way you can live in a society that is this violent and not have it rub off on you. That's why it is so very important that we keep our borders closed to these people. Judy and artist like this. YEP...AND "LADY DACA" FROM DHS JUST GAVE THESE VERMIN 18 MORE MONTHS TO STAY!!! TRUMP NEEDS TO FIRE HER AND KELLY!!! Judy, artist and MW like this. trump get out your pen just as obama did, write no more asylums due to the national crisis of criminals abusing our border programs. EFFECTIVE NOW! obama pronounced decrees and did "in your face congress". financed $$$$ by American citizens. They have a country in which they seem to have no problem safely reproducing babies plus they can pay $$$ smugglers several thousand dollars to approach our border - so lets stop the farce - TRUMP STEP UP TO THE PLATE! WRITE THAT DECREE - NO MORE ASYLUMS TAKEN IN AT OUR BORDER - the OVERLOAD - UNSAFE AND TOO COSTLY TO AMERICANS. OH- THE BUDGET, THE BUDGET, DISCUSS SENIORS HEALTHCARE CUTS INSTEAD = WHAT??? OH PALEEZE - GET ALL ILLEGALS OUT OF THIS COUNTRY - THEIR $$$COSTS ARE OUR MAJOR DRAIN TO THE BUDGET. WE DO NOT WANT TO GIVE INDUSTRY CHEAP LABOR AT CITIZENS' EXPENSE. IT IS CRIMINAL BEHAVIOUR TO ABSCOND OUR FUNDING FOR THE USE OF ILLEGALS AND THEIR WRONGLY LABELED CITIZENS BY BIRTH RIGHT W/O ONE CITIZEN PARENT - THEY ARE CITIZENS OF THEIR PARENTS' COUNTRY - WHICH IS NOT USA. Last edited by artist; 04-16-2018 at 08:17 PM.